What’s the Difference Between a Hawk and a Falcon? Hawk vs Falcon: What’s the Difference Between these two Birds of Prey? Can you tell the difference between these two beautiful birds of prey? Falcons are a bird of prey that belong to the Genus Falco group of birds. Within this group, there are numerous species of birds who share very similar characteristics. Specifically, they are identifiable by their long wings and powerful beaks, which are perfectly adapted to hunting. They also have strong claws for gripping and tearing the flesh off their prey. Falcons are able to fly at extremely high speeds and have an excellent ability to maneuver thanks to their thin tapered wings. Falcons develop long flight feathers at a very early age, something which makes it easier for the young birds to hone their flying skills much more easily. 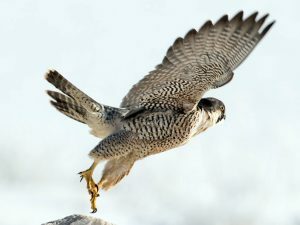 Falcons can reach some amazing speeds; the Peregrine Falcon has the record for the fastest animal in the world and is able to reach diving speeds of up to 322km/hr. Other Falcons include the Lanner, Merlin, Gyrfalcon and the Hobbies, the latter of which has smaller wings that are a long narrow shape. Another important feature of the falcon is that all species share an excellent ability to see things very far away. In fact, their vision is twice as good as humans, making them perfectly suited to hunting animals from far up above. The hawk is another bird of prey and belongs to the Accipitrinae subfamily of birds. Within this family there can be found several genera including the Accipiter, Megatriorchis, Micronisus, and Melierax. The Accipiter branch is the largest and contains the most famous hawk types. These include Sparrowhawks, Goshawks, Sharp Shinned Hawks, and others. Most Acciptrinae hawks tend to live in or around woodland and hunt their prey by using ambush tactics, jumping from hidden perches that are located high up in trees. They have a long tail which gives them excellent control and turning ability. 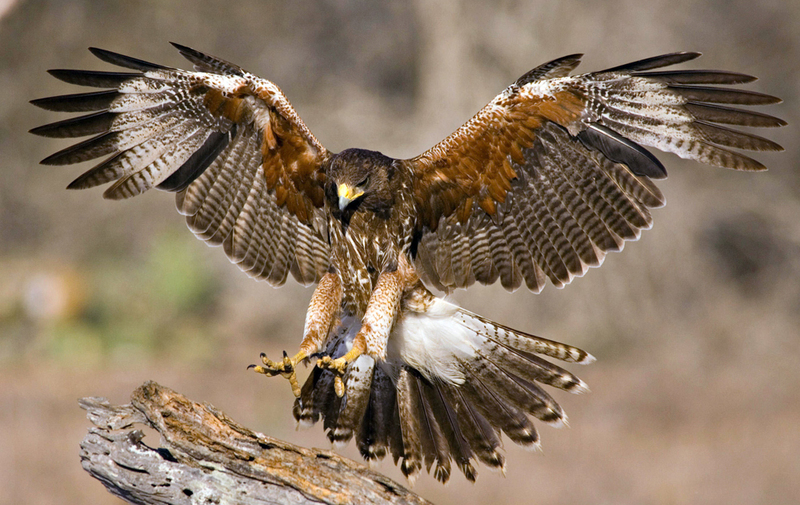 Due to a common misunderstanding, lots of birds are labeled as hawks that actually are not. Many falcons are incorrectly assumed to be hawks. This is most likely due to the strong similarities between hawks and falcons. Most falcons have a more angular neck that has a strong bend in it. This is to allow them to easily break their victim’s neck in one quick snap. Hawks have smoother beaks than falcons as they kill and tear up their prey with their talons, rather than using their beak. Falcons are also able to reach much faster speeds than hawks as many falcons hunt by diving on their prey. Falcons are smaller than hawks but have larger wings.